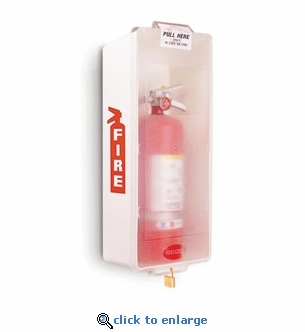 Brooks Mark II Junior Series M2JWC Fire Extinguisher Cabinets with white tub and clear cover features a breakaway cover for quick and easy access to fire extinguishers in an emergency. Pull to snap cover from cabinet to retrieve fire extinguisher. No glass to break. Constructed of high-impact polystyrene and ultraviolet inhibitors, these surface mount extinguisher cabinets will not fade, regardless of the weather or environment. The M2JWC cabinet is Recommended for Indoor Use. Important! If cover is snapped to access extinguisher, the cover will have to be replaced. See replacement covers below for ordering. Service Access Unlock padlock to remove cover for inspections and annual maintenance. See Other Mark II Cabinets Below. Available in white or red cabinets with clear or red covers. Screen-printed Fire Extinguisher Pictograms on Both Sides. Color: White Tub with Clear Cover.